Happy friday everyone!! Sorry I have been so sparse this week....been editing lots of photos. The wedding went wonderfully on Saturday, and I got a lot of amazing photos!! When I post them to my photography blog....I will post with a link here if you want to see them. Well, I have a few cards to share with you today. First up is my card for sketch 172 at CPS this week. Lots of cute My Mind's Eye on this one, and lots of layers too! Instructions: Fold pink cardstock in half to make card base. Round the corners of a striped paper block, and adhere to the front of the card. Round the corners of a green dot paper block, and adhere to the front. Adhere a strip of diecut tickets to the left side of the card. Punch a hole in the left side of the sentiment tag and thread ribbon through it. Adhere to the front of the card using dimensional adhesive. Tie a button around a bow using twine, and adhere to the left side of the sentiment tag. Add the flower & leaf stickers to the top of the tag, and accent the flower middle with a jewel. Add jewel flourishes to the sentiment tag. 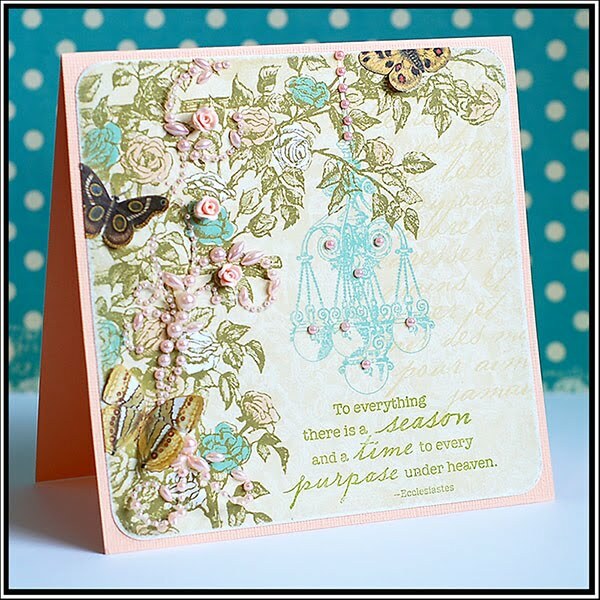 I also have my card for this week's color challenge at Stacey's Stamping blog. With the wedding and everything going on...I never had a chance to get my card done for the design team reveal. But, I still wanted to participate...so here is my card for the week. And...I already have my card done for this coming week...so I won't be missing the DT reveal day! Yay! Instructions: Fold light coral cardstock in half to make card base. Round the corners and sand the edges of a paper block and adhere to the front of the card. Cut the butterflies from another set of the same paper, adhere them to the top of the same butterfly, and leave some dimension on the inside wings. Adhere the pearl flourishes to the floral section on the left side of the card. Accent the chandelier with more pink pearls. Stamp the sentiment below the chandelier. This next card is one that I whipped up really quickly for GCD Studios, as they needed an example with the Homespun Chic tins. 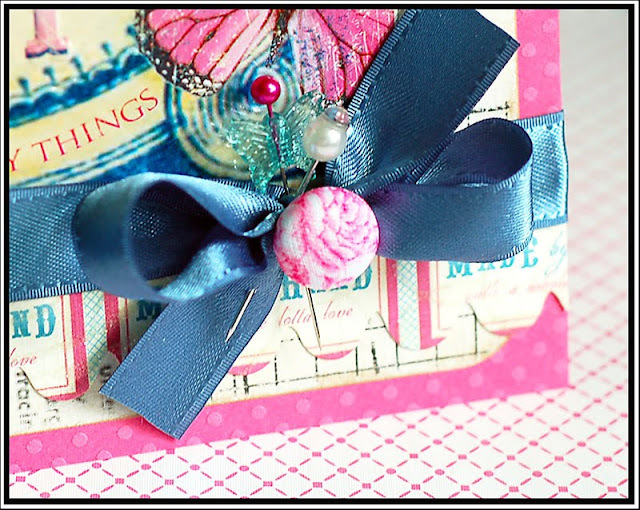 It is featured in a weekly newsletter for a large Australian scrapbooking store called Blue Bazaar. I added a detail shot so you could see the fun ribbon accenting, as it is a little hard to see in the full image. Instructions: Fold pink cardstock in half to make card base. 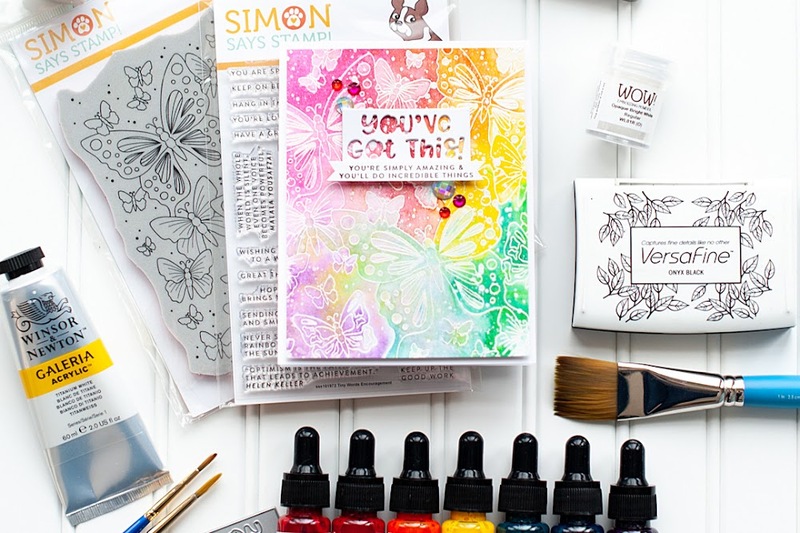 Round the corners and ink the edges of a patterned paper block. Sand the edges of the paper block, and adhere to the front of the card. Add the metal sign and the paper frill to the front of the card. Tie ribbon around the seam, and top the bow with a fabric covered brad. Add a butterfly charm to a pink pin and pierce through the middle of the bow. Add a pearl topped pin at an angle through the bow, slightly in front of the pink pin. I was inspired to do this card when I pulled out that butterfly charm in the last card. The same tin of charms has these fabulous heart charms as well...and there were pretty much every color of the rainbow included. (I did substitute indigo for pink.) I wanted the card focus to be entirely on those cute heart charms, so this is what I came up with. I love it!! Instructions: Print the sentiment to an unfolded white card base. Fold the card in half, and round the bottom corners. Thread the heart charms onto twine, and adhere to the middle of the card. Add a twine bow to each side. 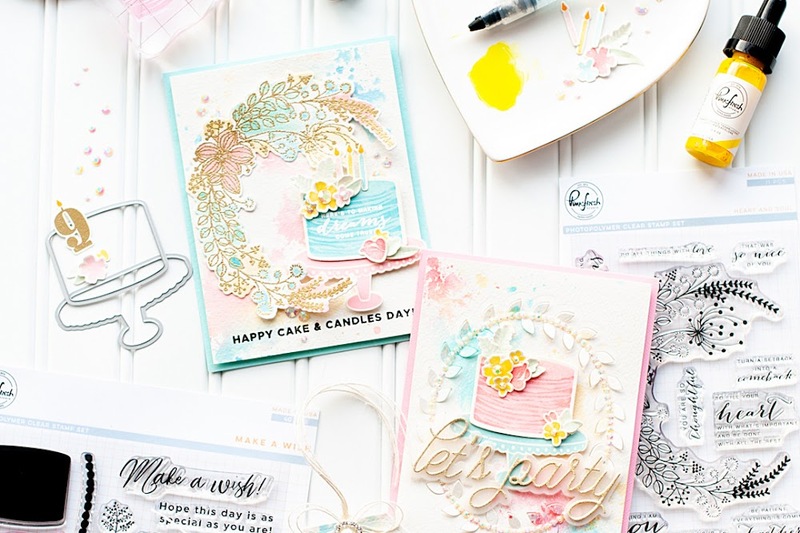 I got some happy email yesterday, and had a couple cards picked up for the latest special Card Creations issue called "Favorite Occasions". Pretty happy about that...especially considering they have SO many submissions for every call now. It keeps getting harder and harder to get in the magazines. I have some cards that I made for the call that didn't get picked up, so I will be sharing them over the next couple week's. I have my first training session on Sunday for our missions trip to Kenya. We are going to be getting to know each other better as a team, learning more about Kenya and its needs, and brainstorming more fund raising ideas. If you know of any great ideas for fundraising, I would love to hear them! Please share with me! But I will leave you with this. Even if you haven't been following the FIFA World Cup....this is just amazing. It brings tears to my eyes. Lovely cards, Lea! 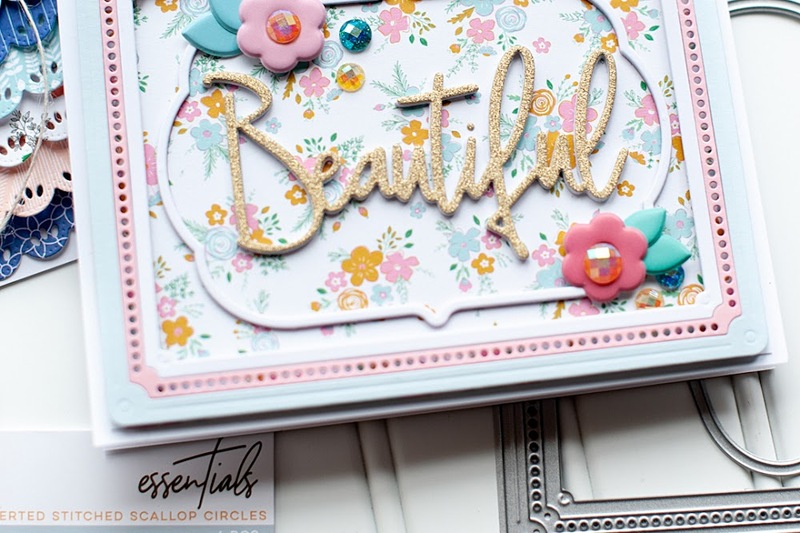 Your card for the Curtain Call this week is especially gorgeous! And I love the simplicity of the last one with the heart beads. 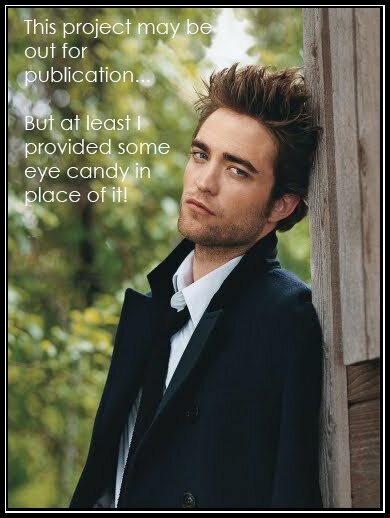 Congrats on the publications :D Love the card with the hearts on it. I'm still SO excited for you about Kenya!! I'm living vicariously through you :D Great clip on the soccer game. Having competed in many sports over my lifetime, I know from first hand experience the amazing feeling of winning a tough game. It is so rewarding! Loved it then, and love seeing it now. Canada winning hockey gold in the men's and women's at the Olympics had me crying like a baby - was so proud of our country. Loved seeing all the reactions on the clip! You Americans have so much national pride - I love it! Hoping they can carry on and begin a soccer revolution in North America. Your cards are awesome, so irresistable with matching colors and ideas of layouts...Your publications are always up..congrats! Your cards never disappoint... these are all completely stunning!! The rhinestones are familiar for your work and I love how you used them for this. I'm lovin' all the goodness in this post! 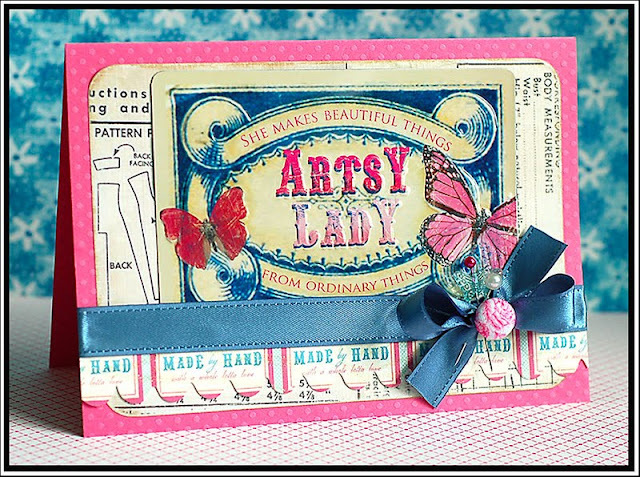 :) Your cards are absolutely fabulous! No matter what "style" you chose to do, you always amaze me with your talent, girlie! Big CONGRATULATIONS on you publications! That's so exciting and you deserve it SOO much!! 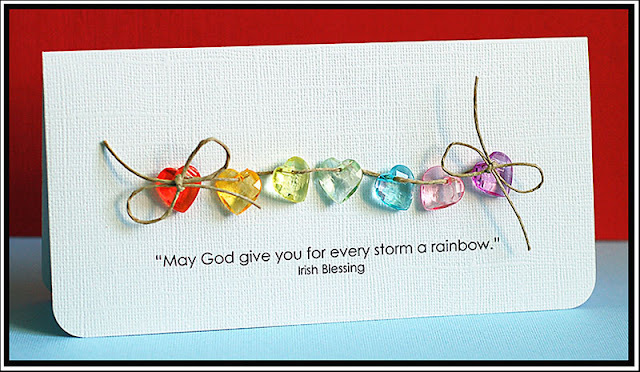 LOVE this card....so cute & sweet, like candy for the eyes! So glad you posted that clip so fun! It really is so moving! Fabulous cards Lea! My goodness Lea, these are all positively swoon worthy! Your rainbow hearts blow me away! !